Again, click on the image for a larger version and the option of downloading the original image (11,038×2493 pixels in this case). This bottom half or so is the easier section of Gibraltar, I should mention. By easier, I simply mean that it isn’t as brutal as the second half. Here, you might just be able to stay out of your granny gear and push it a bit. Just don’t kill yourself pushing on the bottom half as you will need some reserve energy for the top half. (Again, click for larger image). And yes, that twisty section is pretty steep. You’ll likely be breathing somewhat hard by this point. See, you will smile when you hit this brief easy section. 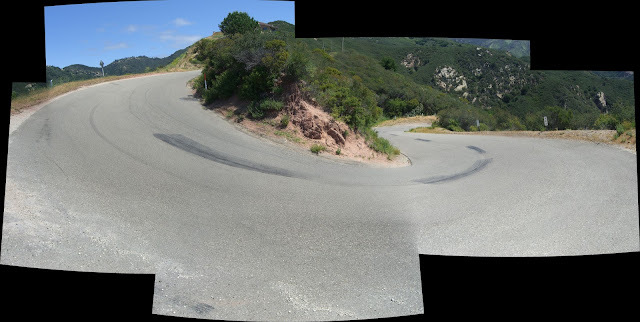 Unfortunately for you, the grade kicks up quite a bit after the next bend and taunts you endlessly until you hit East Camino Cielo (luckily, not too much further). Steep…and sucky asphalt to boot! If you make it this far and hit the intersection with E Camino Cielo, congratulations! Gibraltar is by no means an easy climb and you should pat yourself on the back for having completed it. Or, if patting yourself on the back feeds your ego too much, you can go and reward yourself with a beer at Hollister Brewing Company. You have, at the very least, earned yourself that. By the way, Hollister makes some astounding IPAs if you like your beers bitter. I jump ahead of myself though. You do still have some more riding to do. Thankfully, this is easy compared to what was just completed. Again, click on image for larger size. This one is definitely worth clicking on for the higher res version. Downloading it will get you the 7122×2466 pixel original – quite nice if I do say so myself. Such incredible mountains! And yes, again, click on that for the bigger version. At this point you can continue along Camino Cielo. This will give you about 6 miles of rolling hills that generally tilt downwards. To be honest, I haven’t ridden most of this section, but I plan to at some point. It is supposed to be nice. Up to you if you want to add this on to your ride! Of course, when you are climbing through scenery like that, the climbing suddenly doesn’t seem so bad. Nature can be pretty cool. Seriously. Could this be a nicer descent? After descending the two tight switchbacks, the rest of the descent is fast, fun and scenic…and requires very little braking once you get to know the curves. Averaging 30mph down (even with the slower top section) is definitely doable – and really, really fun. Also, near the bottom, pedal a bit and you will break 40mph. This is one awesome descent with a road surface in almost perfect condition (the biggest problem is the occasional spot of road debris – small pebbles/rocks and the like – just keep an eye out for those rare sections). By the way, the last mile can absolutely be done at a minimum speed of 35mph. Enjoy. Once you run out your awesome descent, turn left onto Cathedral Oaks and pedal a quarter of mile back to Tuckers Grove Park and complete your ride. And yeah, go and treat yourself to a burger, fries and beer at Hollister as you have earned it. If you don’t care about the beer, The Habit in old town Goleta makes some awesome chili burgers (and is much cheaper than Hollister). Check out the elevation profile on that one – the Gibraltar section averages about 7.5%. Not bad considering it only gets progressively harder the further you go up! I haven’t done Gibraltar yet. I’ve done Old San Marcos and Painted Cave. I met a bicyclist yesterday on the Pass, her name is Madeline. SHe called me The Turtle ‘cuz I am slow but steady. Hi turtle and welcome to Tough Ascent! Slow and steady is better than blowing up before you get to the top of the climb, so no shame in going slow. For me, sometimes I like to hammer up a climb. Other times, it is nice to take it slow and just enjoy the scenery as the elevation numbers tick upwards. Anyway, I hope you get a chance to try Gibraltar soon before it gets really hot and before all the green disappears. Absolutely nothing wrong with slow and steady. Not only do you get there, but you get to enjoy the scenery along the way! One day maybe I too can do that ride….very impressive Carmen! Love your photos. When I lived in Santa Barbara, Gibraltar was absolutely my favorite ride. I now live in Ojai and climb to Rose Valley or Lake Casitas. Yesterday, I stumbled upon Sulphur Mountain Road! I had no idea what I had gotten myself into, but managed to claw my way up. I was going slow enough that a cloud of gnats tormented me the entire climb. I found your site looking up that ride today. What a great site with excellent information, photos, maps, etc. Thanks for collecting the info for these rides. See you on the road! Gibraltar is an amazing climb. Sulphur Mountain is quite the unknown climb it would seem. And, given the grade, it is a rather slow climb. Great climb though. Glad you enjoyed reading through my ride reports. Happy riding! Given what Carmen has said about you, I’m sure you could get up to that level in no time. Just did this one. Much better than going down Gibraltar! Nice ride and thanks again for the info. Snow on La Cumbre! Nice. Glad you enjoy the blog! It is still an awesome climb! If you are coming from the north there is camping at state beaches along the coast-Gaviota, Refugio and El Capitan. South of SB is Emma Wood State Beach in Ventura and Carpinteria state beach. Enjoy the ride! Whilst over in the States for a couple of weeks on business I Rode up Gibraltar Rd yesterday after reading this informative post. Thought you might like to know that 3/4 of the climb has been resurfaced. It’s like a carpet now In comparison to what was there before from what I understand. The locals told me this was completed a couple of months back. I really enjoyed enjoyed the ride and my coffee in the Handlebar Cafe in down town Santa Barbara afterwards. I am considering doing the Santa Barbara Century this year which includes this climb I think (?). I did the Temecula century last year, which was a little more overall elevation gain but nothing like Gibraltar road. I am looking for opinions on whether or not I have enough time to train to finish this climb. I’m not looking to break any records, but I haven’t been on the bike more than 2 days per week lately. If I stepped it up in the next few weeks, would I be ready? Great write up, I’m looking forward to doing this climb. Are there any places I can stop along, or before, the climb to refill my water bottles? I’ve been trying to find water stations along popular cycling routes using Google, but have had absolutely no luck so far. Maybe I’m using the wrong keywords. Thanks in advance! Gibraltar Rd (and Camino Cielo for that matter) does not have any water fountains/spigots. However, if you descend Painted Cave Road, then before you descend through some switchbacks, you should be able to find a water spigot at the corner with a little Painted Cave residential road on the right (Manzanita Dr, I believe) where you can refill your bottle. Otherwise, you will not find any water anywhere along the ridge. (Bring at least two bottles on a hot day.) Good luck! I am driving to LA this weekend from the Bay Area and looking at stopping in SB for a workout and want to do this climb. Are there any road changes after this winter that I should know?